Maia : Daughter of Boudica **SOS**TAK**GSO** is in your extended network. Maia was born in a nomadic tribe of warriors in Belad-al-Irem, the Land of the Terrestrial Paradise, also known as Hyrkania. This fabled land of wolves was abundantly populated with numerous canine species such as; babr, tiger; guraz, boar, rubah, foxes, shegkal, jackals, gurg, and the winter wolf. In ancient times, Hyrkania had been infested with panthers and tigers that were so fierce and cruel, that it became a popular proverb concerning fierce and unrelenting men and women: that they had suckled from Hyrkanian tigers during their babyhood. These Hyrkanian Warriors were barbaric nomads in their characteristic way of life. They lived off the land and hunt together like a tribal pack of primeval humans. This hierarchy society is made up of a chief and his family, captured female slaves integrated into bloodline marriages and children born all throughout the generations. Maia’s mother had been such a slave once, captured and forced into marriage against her will. Her father was a son of the chief, although not the first born, he was greatly respected as a warrior. 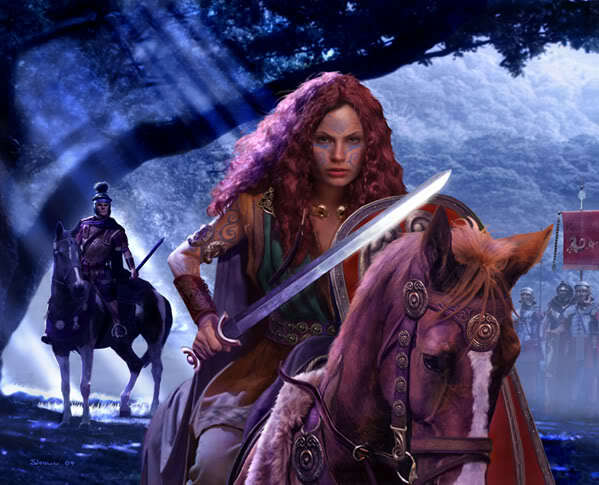 Boudicca was the wife of Prasutagus, who was head of the Iceni tribe in East England. She led a revolt against the invasion of Roman dictatorship and freed her people from slavery. Thousands were killed on both sides. Finally, Boudicca was defeated by a Roman army led by Paulinus and fled to regroup her people and recover from their wounds. The Romans were eventually driven back by the additional arrival of Vikings from the sea, during which time, the Hyrkanian army moved north for easy pickings. While trying to find safe haven from the Roman and Vikings incursion, Boudica had come upon the Hyrkanians and was claimed as a concubine, her two existing daughters married off to other eligible warriors. Maia’s older two sisters were an inspiration for her. The slight older one was named Heanua and was fierce tempered, following the footsteps of her mother. The younger one was Lannosea, calm -minded and passive. Maia inherited both sets of personality as she grew up under their influence. Hyrkanian archery is legendary. Their recurved composite bows are made from wood, horn and sinew glued together with processed resin from trees. Resin is a substance that has a jellylike state at first and once treated, gets hardened to solid form. The Hyrkanians get the bows from artisans who live in villages or the western slopes of the Mountains of Night in Khitai. The strength of one of these bows is rated by the number of men required to string it. Youths use a "one-man" bow, most warriors use a "two-man" bow, which can also be strung by one man with the aid of a special harness, and the strongest archers use a "three-man" bow. Since these bows cannot be left strung for more than two hours without cracking or losing resiliency, Hyrkanian warriors generally carry two bows. Harkanian women use a hardwood lebethron bow, crafted from the branches of a tree that has become the sought object of their ceremonial rites. The lebethron tree is unique to the woodwrights of Gondor, growing more abundantly in the Ered Nimrais region. Young aspiring warriors were sent to this mountainous region on a quest to craft their own bow. Maia saddles up her gelding horse and pack mule, riding many days and nights towards the Whitehorn Mountains. Throughout the preceding millennium, the countryside beyond the cape had been systematically deforested by the Númenóreans in their greed for ship-building timber, and was then almost completely burnt down during the uprising War of the Elves. By the war′s end, the surviving natives of Minhiriath had retreated to either north to Stygia, or hidden themselves in Eryn Vorn, but the whole region was largely disregarded by both Elf and Númenórean thereafter as being nothing more than wasteland. In the abstinence of civilized peoples, wild trolls and goblin hordes had lastly taken up residence in this war-scarred region and repopulated it. The Black Forest sprung up again from its deep persevering roots and was now a dangerous place to be, alone. Since the dawn of their refuge after the war, wizardry and druidry were admired and respected by these nomads. They were horse warriors and shrewd traders, defending their caravan society against all intruders, and they completely dominated the coast along the Vilayet Sea. They maintained close ties with the Hyrkanian tribes east of the Vilayet, who were recognized as being affiliated with the Empire of Turan. The Hyrkanians would often go raiding other tribes; stealing their horses, capturing the women to be concubines and children to grow up as warriors. Otherwise they would mercilessly kill those who stood in their way. "We do not want to rule over conquered peoples," says the proud Hyrkanians, "but over great pastures." 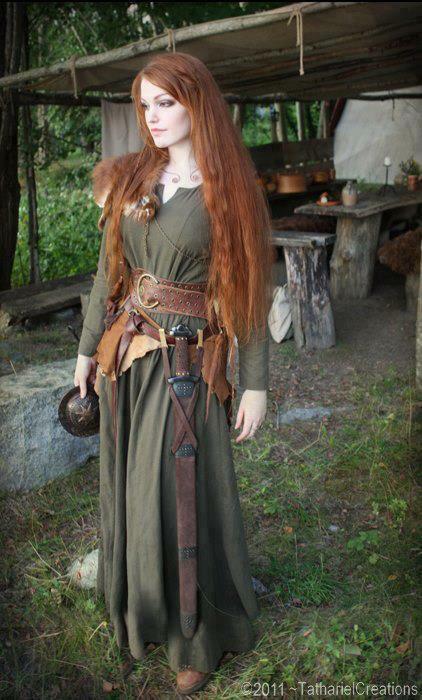 The Celtic Maiden with the Fiery Hair is as Fierce as she is Fair. As a maturing young woman, Maia traditionally wore a braided rope strung around her waist, beaded with the severed thumbs of those who she had slaughtered during seasonal raiding parties. There would be no doubt by a mere glance, of her capabilities and strength as a warrior. She often hunted alongside her oldest sister Heanua. Throughout her entire life, Maia had been curious of her mother′s people and vowed someday to travel in search of them. She also learned the basics of druidry from her mother’s memory of the celtic priests, which was a high valued skill among the Hyrkanians. The chief did not forbid this teaching. 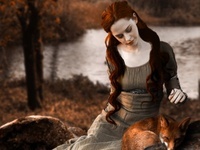 Boudica told many tales of faraway and long ago, feeding into the imagination of the child Maia. When Maia was of age to construct her first bow, she hugged her sisters and mother as she bade them farewell. Maia journeyed solo across the desert steppes of Tūrān, being warily mindful to stay clear of the hostile migrant tribes that were encamped across the desolate vastness of its high arid plateau. She rode cautiously unhurried, while keeping sharply observant of the telltale signs of possible Turan hunting parties. Once the dangerous landscape had been traversed over, Maia guided her steed down into the more fertile valley and followed the shore of the broad river that snaked between the borders of Zembabwei and the Black Kingdom. Seeking a quiet, sheltered place to set up camp for the night, Maia explored the immediate area first before dismounting. She gathered kindling wood to build a small campfire and skinned the rabbit that she had killed earlier with the swiftness of her bow. Skewering the carcass, she wedged it between two V shaped branches over the fire and settled herself down nearby to relax while it slowly cooked. She reminisced her past and daydreamed into the unknown future as the sun slowly sank behind the horizon and the stars twinkled above. And this is where her adventures begin. Maia : Daughter of Boudica **SOS**TAK**GSO** has 61 friends. Seeing the blue flame in his palm he closed his eyes listening to Maia's instructions and attempted to atune himself with the forest and with the flame she'd given him. "Yes. I do feel the forest.. It flows through us both." James not only watched her control her flame, he felt her as she threw the cool blue flames at the ground. "I think I got it." He too stood now letting himself feel the flame in his hand. With determination he threw the blue cool flame around hers, his hands controlling, manipulating his to form a Phoenix as if to let Maia know he'd always be her friend and protector. He knew she'd feel it as well as see his blue flamed Phoenix. "For you my new good friend." The flirting between them was genuinely fun. And he meant what he'd said. Women often made him nervous. He'd always had trouble reading them. But their chemistry seemed to grow. "Boring.. No.. I don't think you are. I mean you're gorgeous and you want to be a warrior.. How can that be boring?" He asked her. James reached for her leg to ease her worries if there was any. "I like someone. That said, I don't know how she feels.. We really have just began talking. I met her around the same time I met you. Thing is, you and I started talking first." I times like this he often rambled on. "What I'm saying is that I like talking with you. You interest me because of who you want to be." James smiled over at Maia. "Yes, we had several occasions with the Red Skull. Hes a nasty person." He listened to Maia telling him of her plans. 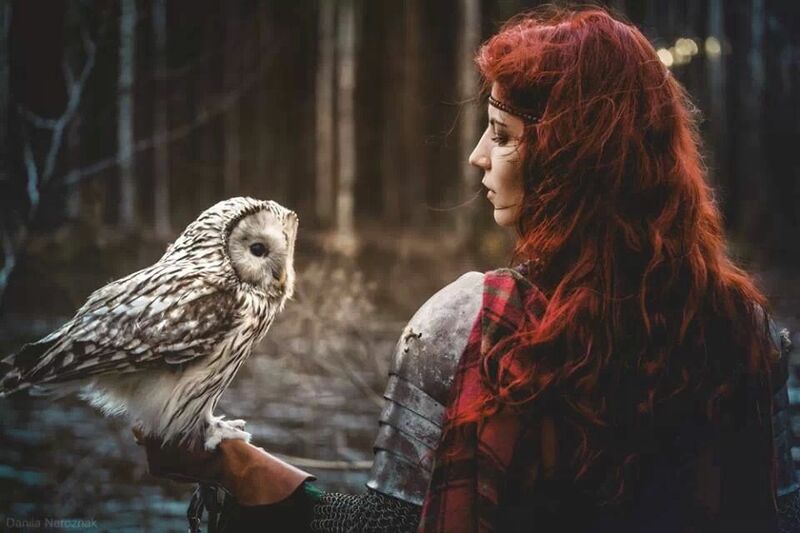 He knew by the way she spoke she'd be a great warrior. "She'll be proud of you for sure." He took another long drink from the sweaty beer can. "The bionic arm is why I can throw the shield." He tapped the shield strapped to his back. "But I'm unsure of its full potential." He looked at her. "You're the type a man could get lost In. Beautiful warrior." James nodded. "At the end of the second world war. I was partnered with Captain America. I'm the one who was called Bucky." Those last days with Cap were some of his most memorable days. "We'd learned that the Red Skull had stolen a drone plane and was sending it to Washington. We boarded it. I got stuck. Cap jumped free. I got free at the last second. But lost my arm." His intent wasn't meant to be or make her feel uneasy. He took the cold can and popped it open taking a long sip. "I'm James, Maia. James Barnes." He half turned to make sure he sat on the bench beside her under the shade from the tree. "I am not what you may think." His left arm hummed as the holographic skin removed revealing his bionic arm. "I'm mostly a man except for this." James walked Maria and her mare to the trough. "I am well thanks." He gave her a nod along with his answer. "Yes. A beer sounds nice. May even calm my around such an attractive woman as you."